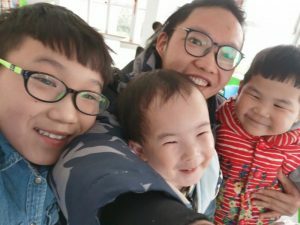 During the Lunar New Year, one of our Chinese team members, Damon, made the trip to the Heze Welfare Institute in Shandong Province to visit Hector, Shawn and Flynn. We wrote about his trip in the March issue of Heartbeat. As soon as he met with the children, Damon noticed right away the drastic difference in Flynn after his successful heart surgery. He has gained weight and is no longer pale and blue like he was before. He greeted Damon with a big bear hug, and it was obvious how much healthier he has become. He described Shawn as “still so cute and full of life,” and he commented on the good care the boys are receiving at the orphanage. Damon also visited with our one-of-a-kind Hector, “big brother” to Flynn and Shawn, who is now 11 years old. He brought some special gifts for Hector and was really touched when our kind and thoughtful boy shared them with the other children in the orphanage!